I think we can all agree that it would’ve been extremely entertaining if we had watched the quarterfinal version of Novak Djokovic and Roger Federer go at it in today’s semifinal. Both men were in imperious form on Friday, so many in Paris and elsewhere on the planet were somewhat justified in expecting a classic today. Both men were to blame: Novak Djokovic played some maddeningly sloppy tennis for a set and a half, and Roger Federer went from satisfactory competence to worrying deterioration at more or less the same time. It was as if a baton of mediocrity was handed from one man to the other midway through the match. 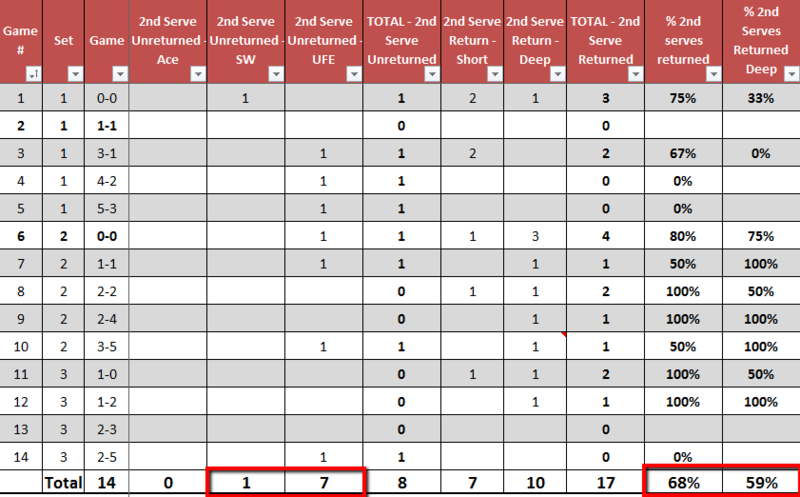 Still, while tracking the returns of serve for both men, I noticed something pretty interesting: even when Djokovic was down a set and a break to Roger, he was outperforming him in all but one return of serve category (percentage of first serves returned deep). And while the return numbers didn’t say much about Djokovic’s wobbly start, they do show Federer’s significant decline in the second half of the match. – I’ll keep this simple: returning 76% of all serves in a professional match is a very, very good thing. Particularly good if the serve you’re trying to return belongs to Roger Federer. Also notice how consistently Djokovic put returns back in play: he only returned fewer than 40% of serves in two of the 13 Federer service games. 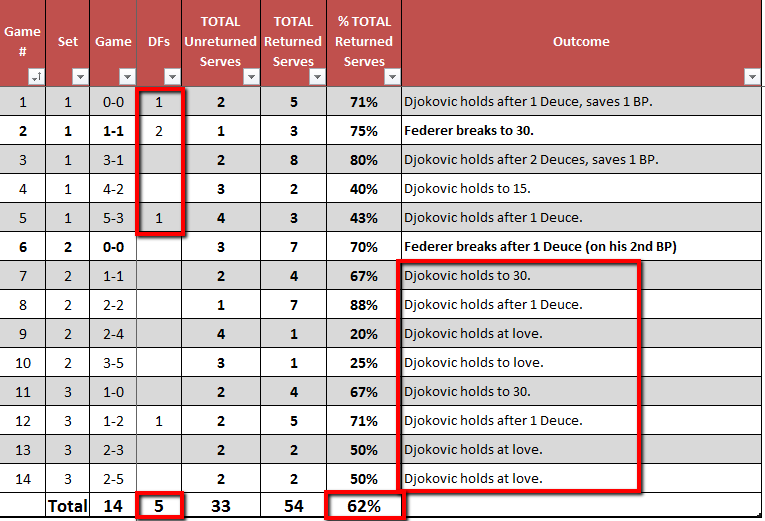 Djokovic only conceded two love holds, and a single hold to 15. Djokovic also created break chances in five different games, broke in four of them, and had chances to break in every set. All of the above are very good things. – Djokovic’s percentage of 1st serves returned is pretty good indeed, but the percentage of those that were returned deep isn’t all that exciting. As I mentioned above, this is the one return category where Federer actually outperformed Djokovic. Watching this match made me want to tally how many returns were low, drive shots and how many were lobbed, floating slice shots. It seemed to me that a vast majority of Federer’s deep 1st serve returns were of the latter kind: stabs that sent ball floating back to Djokovic’s side of the court. In principle, a deep, lobbed return isn’t necessarily a bad outcome: it’s not a counter-punching return that turns the tables on the server, but it does neutralize the effect of a good first serve. It gives the server a chance to attack, but from behind the baseline and with the added difficulty of having to generate all the pace, since the floating ball carries none. Also, the returner has plenty of time to set up for the server’s post-serve shot. This style of returning (which Federer has used throughout his career), used to work extremely well against people like Andy Roddick and Lleyton Hewitt, who couldn’t really generate a punishing post-serve shot after one of these floating returns. They also worked well against impatient types like Marat Safin, who had the pace to start a rally with an aggressive shot, but were probably too frustrated to see their first serves come back with no pace at all. However, this style of returning doesn’t work very well against aggressive baseliners like Djokovic or Nadal, who are more than happy to generate pace from behind the baseline and start a rally. This is a big reason why Novak Djokovic won 72% of his 1st serve points today, which is just 3% under his average of 75% for the year (which includes many matches against lesser opposition). In stark contrast, Federer ended up winning just 68% of 1st serve points today, which is 9% lower than his average for the year. At any rate, more about Federer below. 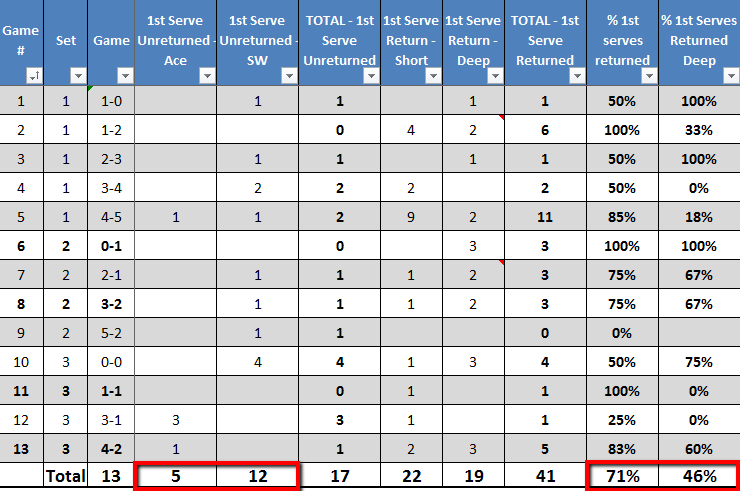 Back to Djokovic: the Serb conceded 17 1st serve free points (service winners and aces), which adds up to 1.3 1st serve free points per service game (not exceptional, but not bad at all, given the opponent). However, there were 3 games in which Djokovic didn’t give away any freebies to Federer’s 1st serve, and only 3 games in which Djokovic conceded more than 1 free point. – Simply put, this is where Novak Djokovic makes his millions. Like his WTA twin Victoria Azarenka, Djokovic takes 2nd serve returning to another level. He only missed 3 returns, and two of them were in a throwaway (Sampras-esque) return game in the second set. That’s good for 89% of 2nd serves returned successfully. But more than that, it’s the 71% of 2nd serves returned deep that create a chasm between Federer and him, as we’ll see below. – Two things here: 1) The one place where we can see Djokovic’s early nerves: 4 of his 5 double faults came in the opening set (indeed, 3 of the 5 came in the opening two service games of the match). 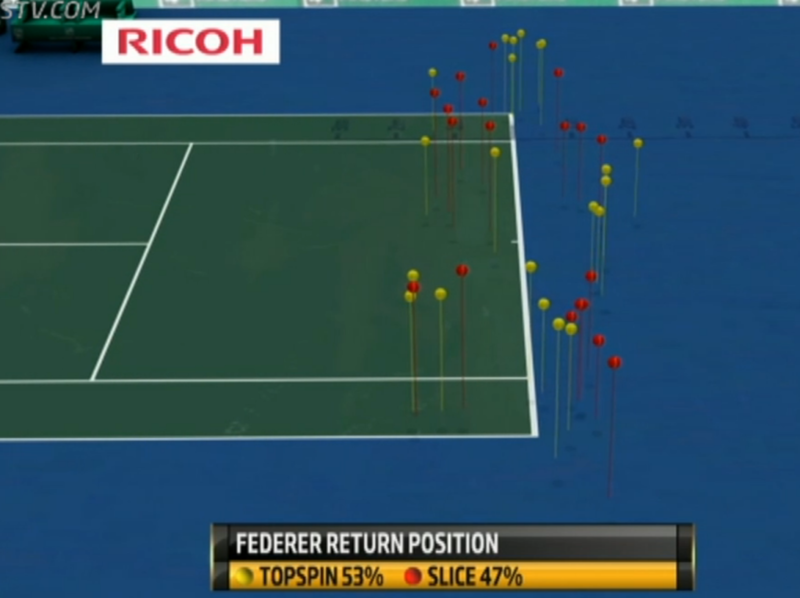 2) The big red highlight is where Federer’s decline shows up. At the time it would’ve seemed strange, but after Federer broke Djokovic to start the second set, he would not have a break point for the rest of the match. That stretch of 8 games included 4 love holds for Djokovic, 2 holds to 30, and just 2 holds after a single Deuce. 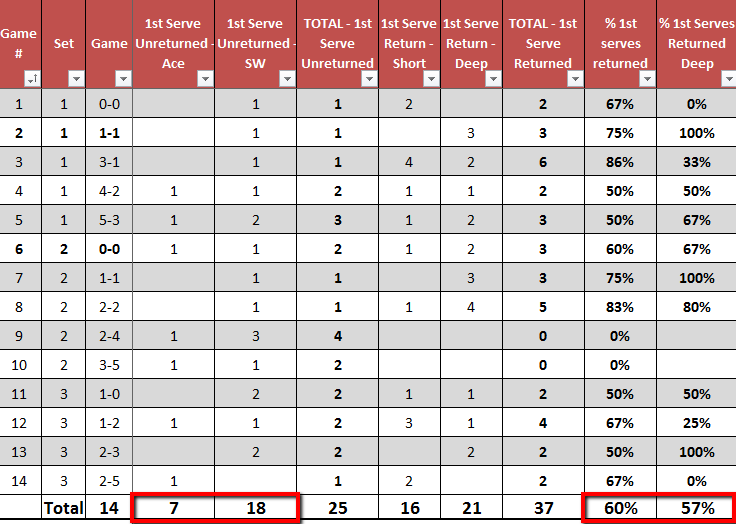 – And then we have the glaring figure: just 62% of serves returned for the whole match. There’s no way to sugarcoat this: it’s just not good enough to beat the elite. Federer failed to return 33 Djokovic serves (in one more service game), which is significantly more than the 20 Djokovic couldn’t put back in play. 13 points is a lot at this level: in fact, it’s the same difference between total points won (97 to 84). What’s slightly baffling is that Federer’s number doesn’t even vary that much from set to set: it was 64% in the 1st set, 61% in the 2nd, and 62% in the 3rd. Based on how competently Federer was playing in the first set, I expected there to be a wider discrepancy in returned serve percentages by set. To me these numbers suggest that Federer’s return game is not necessarily linked to how well he’s playing. – Federer conceded 1.8 1st serve free points per game today, which is a bit high. Moreover, you can see above that Djokovic could count on at least one freebie in every single game. 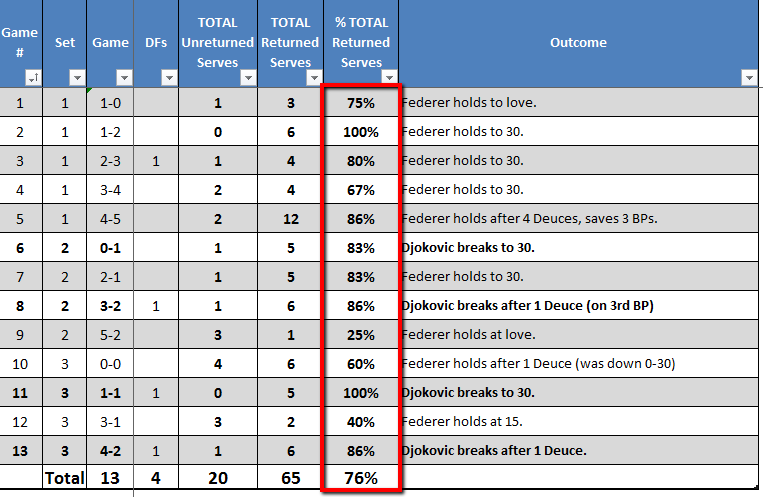 In fact, Federer gave away more than 1 freebie in 8 of the 14 service games. What is remarkable is that even considering the numbers in the above paragraph, Federer was into so many Djokovic service games. But that might have more to do with the Serb’s initial sloppiness off the ground more than anything. – As we see here, Federer returned only 60% of 1st serves, which is a little low, but not horrific. 57% of them deep would be fantastic if more of them had been fast, counter-punching returns. As I wrote above, Federer only brought Djokovic down 2% from his yearly average of 1st serve points won despite all this depth. – No use trying to be gentle here: this is a mess. Giving away 8 2nd serve free points is way too much, even against the 2013 leader in points won with his 2nd serve. 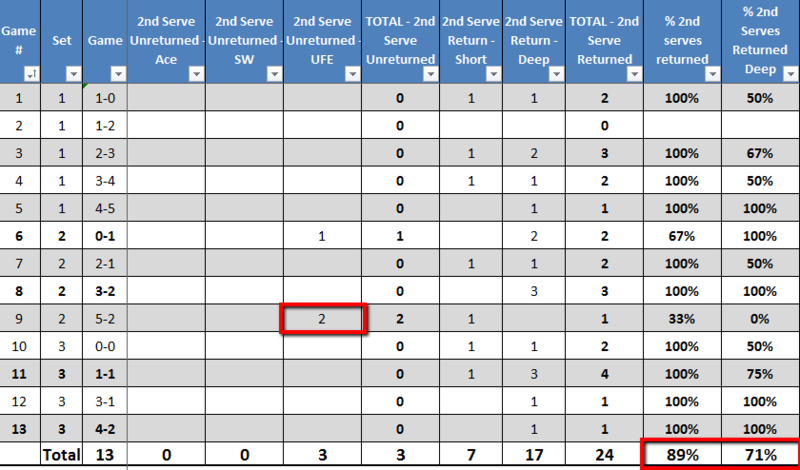 Also, notice that I distinguish between 2nd serve aces, service winners and unforced errors. 7 of those 8 freebies were of the unforced kind. Also, 68% would be 21% under what Djokovic was doing to Federer’s 2nd serve, and in terms of depth, Federer was 22% under what Djokovic was doing against him. That’s way too big of a gap, and it seemed to widen from the middle of the second set onward. Second serve returns is the area of the game that’s changed the most since the Federer era started. Nowadays when you face the elite of the sport, you just can’t afford to miss a second serve return, or to even hit short returns. For many years, Federer got away with his neutral backhand slice returns (not to be confused with the very short and very dangerous backhand slice returns that he sometimes hits), since he could afford to outmaneuver and overpower most of the ATP in baseline rallies, including the elite of that time. That’s just no longer the case these days, and Federer’s recent record against Nadal, Djokovic and Murray is indicative of this trend: since 2011, Federer is 2-7 against Nadal, 3-8 against Djokovic and just 3-3 against Murray (they actually didn’t play at all in 2011). That’s a combined 8 and 18. Even if it’s a return of serve analysis, you are pointing some strange fact about Federer : his dominating first set wasn’t better for the return stats you highlighted. So, the return of 1st ball was actually slightly worse in 2012 ! What about the “golden years”? I dont see how showing us Fed’s head to heads against Djokovic-Nadal-murray from 2011 can be indicative of anything, because those are matches since Federer turned 30. The slice can be a useful tool to move people away from their comfort zone, and can especially be effective against a player like Djokovic who hates low balls. Federer is just not quick enough these days to get to the ball to produce a more effective slice.